Today’s terms are… um… confusing. I mean, really. Would I kid you about something like that? Okay, okay, if you want to be really picky about this, there were actually six brothers, one of whom died young, one of whom plays no role in this story at all, and one of whom is essentially a bit player since all he did of any great significance here was die. Actually, three of the brothers went south: Alvarez, Abijah and Stebbins ended up in New Orleans where they became very wealthy men. The baby, the second child named Sereno, is the one who went west, ending up in Wisconsin. There’s nothing in the records to suggest they didn’t get along perfectly well, as brothers go. And then in 1837 Stebbins Fisk was the first of these four to die. Now no matter how you cut it, $100,000 in 1837 was a whole lot of money. Thanks to my friend Harold Henderson,3 we can find sites to calculate just what that legacy was worth in today’s dollars: somewhere between $1.9 million and $2.5 million in cold hard cash. Worth fighting about, in my book. And that’s just what the Fisk family did: they fought about it. 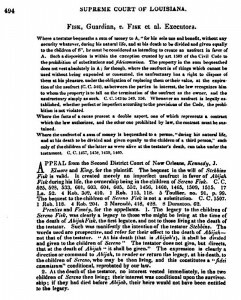 Now at that point, Sereno waltzes into New Orleans, says his kids are now entitled to the $100,000 since Abijah is dead, so hand it over, nicely, and… Yeah, right. You know how that went over, don’t you? Welcome to the wonderful wild wacky world of the Civil Law. As explained by Claire Mire Bettag, “Unlike common law, which is rooted in ancient English law, civil law derives from Roman law. 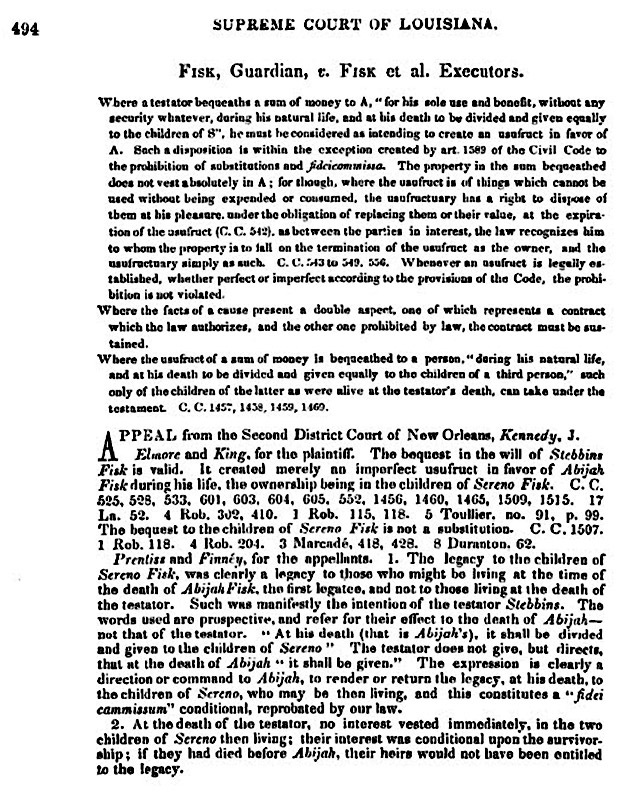 It is usually written as a code and then adopted legislatively as a comprehensive body of law.”9 And Louisiana law — its Civil Code — was “strongly inspired by the French code.”10 So it should be no surprise that — since the Code Civil of France had an entire title devoted to this oddball thing called usufruct — the Louisiana code did too. And that’s what Sereno was arguing on behalf of his children as their tutor (akin to a guardian in the common law13): Abijah had had the use of the money during his lifetime and got all the profits from it, but at Abijah’s death, it should get paid over to his children. In effect, he said, it was nothing more or less than a life estate in the cash. And if you’re descended from or related to any one of these Fisks, getting names, relationships, dates and places of death for some of the brothers and the exact years of birth of Sereno’s children and even a month for the youngest, is worth working your way through the language of the law. I can see that several glossaries in several languages might be needed to dig find one’s way through this challenging case. Sigh – just looked, and I’m not related at all! Not a Fisk on my tree. Thanks for such an interesting post, Judy.